Breast Reduction surgery is ideal for those women who feel uncomfortable due to the large or disproportionate size of their breasts. It is like an investment that can help a woman achieve an improved shape and feel comfortable in her own skin. Results of the Breast Reduction Surgery are quite promising if you choose the right surgeon for the job. However, you can’t expect the same results for everyone. However, an expert plastic surgeon will always try their best to provide effective results to every patient but there are various factors which affect the results. One of the most frequently asked question about Breast Reduction Surgery is that for how long the results will last. Results can be maintained for longer period of time if a patient makes some essential changes to their lifestyle and habits after the procedure, as per the surgeon’s advice. Following are some of the things which your plastic surgeon will suggest to make your recovery journey more comfortable vis-a-vis ensure long term results. The most common discomfort patients feel after the procedure is due to swelling that may last for several weeks. The position you sit and sleep plays an important part to control and keep the swelling down. It’s a better idea to keep your chest elevated and do not lie flat on your back and keep the chest area lifted. Patients will be suggested to wear some sort of compression garments, which is another way to keep the swelling down after the procedure. After the removal of bandages from the treated chest areas, it’s important to wear the soft and supportive bra to give support to your breasts and hold them in a lifted position allowing the swelling and bruising to settle down. Keeping yourself hydrated after the surgery is very important, so drink plenty of water. Patients should avoid alcoholic beverages after the breast reduction surgery for a quick recovery. Whatever you eat after the surgery it plays an important role in your recovery and longevity of the results. Post operation period is the time for healthy and nutritious food to fasten the healing process and therefore you should avoid junk food or any complicated diets. After the surgical procedures, it’s quite hard to take shower daily. After the breast reduction surgery, patients may find it easy to take sponge baths initially and should avoid getting the treated areas wet. Shampooing hair might be hard as the doctors advise not to lift your hands above your head after the procedure for a few weeks. So it’s better to schedule sessions of hair washing or hair dressing with your hairstylist to have him or her at your home to wash your hair for you. For the desired results, it’s advised that you should keep yourself away from heavy exercises and gym during the first few weeks after the procedure. Go for a morning walk to keep yourself healthy and fit. But don’t engage yourself in intense workouts or exercises because they will put stress on the treated areas. 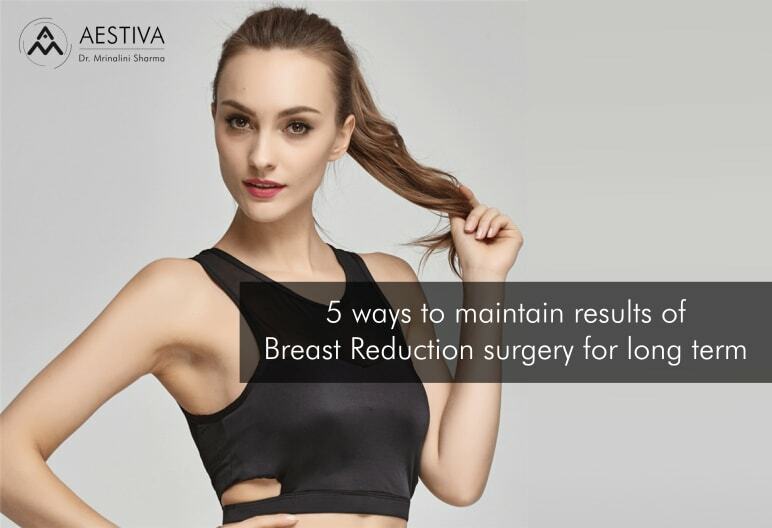 We at Aestiva Plastic Surgery Clinic help you under the guidance of Dr. Mrinalini Sharma throughout the procedure and later as well to ensure quick recovery and a comfortable experience. We are always here to resolve your doubts and discuss about your concerns. If you have any questions please feel free to contact us at info@aestivaclinic.com.